Anyways, sorry for boring you people up with all the above things, i had a really fun time yesterday, i had gone out with my basically my mamoo (who is just 5 years elder then me), my brother, my neighbors and we had an awesome time. And the thing about it was i went through every single place last night which reminded me of her call it covincidence or maybe destiny. I do feel at times to run away from this city. Haven't talked to you for like a month and this time this is the firt time ever that has happened. Buhahaha i just can't stop writing... anyways i'll survive i know i will. Because my little private mind, I'd always keep on to my own. From now on holding on to myself, Reaching not to anyone. Screams no more, Just sulk within the sullen face. The growing cold within, Surrounds the mind, changing every little thing. But today i have decided, decided things which should have been enforced ages ago. No more S.O.S, No more asking for help. Even if all of you're gone. Away from my disgusting self, There's always one thing I'd have on my own; Me, myself and I. All three of them are the only key to my secured mind. The only ones who can understand it. Oyeeee wasn't it suppose to be party sharty scene in this post ;) *Wears a funky cap, taps foot and starts singing* Let's start some Ronauk Shounak.... Let's have some party now.... Let's have some Raala Rappaa... Rang de chak a... lalalal... Let's have some dhol dhamaka *dhim chika dhim a chikaa* Let's call the dholi now *touuu tuuu touunnn tuuuuu*.. Rang de chak aaa... rang de chak... Let's have some matti tappa.... Chalo chalo ji lak lak gao lo, Chalo chalo ji Mauj bana lo... Chalo chalo ji Nach lo Gao lo... Pakad kisi ki Wrist... anyone wana dance with me ;) !!!! kher, UB, thanks man, i owe u a lot, u are truly a genuine and amazing person, and im honoured to know u =) take care, and i hope and wish for the best for u..
Ubaid for me is bundle of energy, MashAllaah has a great sense of humour, makes all of us cry with his sentimental posts aur jab poocho to kehta hai , I'am absolutely fine...HIs thoughts are an open book doesnt pretend behind false emotions, what he is we all can relate to his tags n emotions..Aise hi raho Ubaid, don't change, be the same old sweet guy..dher saari dua. I recently got accquainted with Ubee when I stumbled on his blog. I found a truth in his writing that touched my heart and ever since have been hooked to his blog. From what I have seen I find a hugely talented person who knows that his talent can express his emotions and moods very accurately through his art.Be it poetry, articles or photography, etc. They say that the most important thing in life is love because no matter how much money you have,it is not the basis of happiness. I'm sure you'll be very happy, very successful and have the best of everything in life because you realise the value of love. Giving love selflessly and endlessly is an attribute not many have, don't ever let go of it. Because life always gives you back what you give it. All the best. Ubi-- someone very friendly, very sensitive, very emotional-- and the best part? He's not afraid to show it! He's passionate about his work, his blogging and his writing, and his Urdu poetry specificly is very well-written. By reading him I have concluded that he is a good-natured and practical person but does possessed of a pretty stubborn streak. Does somewhat appear shy and reserved, but has a quiet power and charisma that can speak volumes. Sure does not care what people think when he behaves weird. He could be wearing his shoes without socks and care the least for people who laugh. For ubee's 300th post, he gave me the honor of writing a few words for him on his blog. I haven't known this banda for quite too long, but I commend his ability to pen down all his thoughts in a neat way. His blog is all about him, no fabrication. Though I am not around much (and then I tell him his posting frequency is too high for poor old me to catch up :P) but evey time that I do make a visit, I see a very honest guy. His photography is nice too :) Will you teach me how to do it buddy?? Other than that buddy, life goes on. Don't take things to heart. I know you're a caring guy, but sometimes you just have to forget. I knowwwww you'd feel like throwing something at me for saying this but yaaaar I wanna see all my frnz happy. He's a happy go lucky banda. Yea and I don't like him when he doesn't respond on msn cz of being upset or something. Buddy, im here, vent it all out on me... it will make you feel better and make me feel important. Wishing you all the BEST in your life. God bless you!! With the overload in my heart. Will help me battle all these mocking words in front of me. I finally understand that my voice does reach thee. I'm breaking my own negativity. All I need to do is break it again. Yes i am happy today, infact very happy :) ufff i do love my smile ;-) yeah you all know by know i am way too self obsessed per seriously i'll repeat it again i love my self i love my self i love my self! Wow i just saw this post is really very long. Anyways thanks alot everyone for reading my blog all of you mean alot to me jokes apart you all seriously do... I don't know how many of you would still keep on reading my blog but i think its like a family or something that we all care for each other in the way we can. I wish all of you lots of happiness in your lives and pray for your success in every field of life! And oh oh for my friends who wrote such sweet words for me i love you all i seriously do :) those were really sweet although i think am not that nice and is mai thori buraiyan bhi kr laitay i wouldn't have minded ;-) if you all would be in lahore i would seriously treat you out :) and remaining people who are reading this pls do check out their blogs they all are awesome writers and trust me every single one of them is way better then i can ever be. must be a great feeling :) and to see you happy i feel happy! see the connection within all of us in our little world. 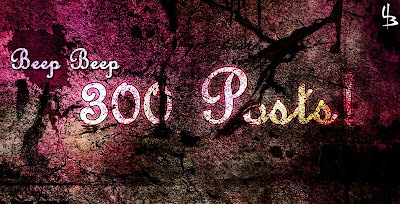 *dances with ubee* woohooo 300 posts! And I simply LOVE "everything" by lifehouse! great stuff! Jokes apart... Congrats n keep sharing your thots . I really enjoy diggin into ur mind. anyhow good luck with your results..you'll do well inshallah !! Wow! So many words of wisdom, all those poems and awesome pictures.